Orders of just over $41.5 million were somewhat off from five-week May, and slightly up over June 2012. At the same time in 2012, the Direct Market had placed orders for $222.9 million worth of comics and trade paperbacks; year to date, the market is up nearly 12%. The pace of increase has decelerated: the second quarter beat 2012 Q2 by 5.43%, whereas the first quarter beat 2012 by almost eight more percentage points. 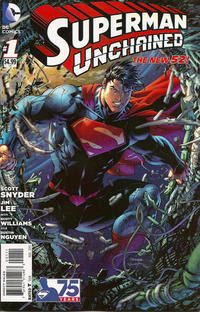 Superman Unchained #1 was the top comic book during the release month of The Man of Steel movie, and at $4.99 its total dollar volume will easily top $1 million. (The flag-covered Justice League of America #1, released at $3.99 in February, is likely to remain the top-seller for the year.) DC took the top three slots on the chart, followed by Marvel, which had Age of Ultron #10 as its top seller. The new Walking Dead collection, Walking Dead Vol. 18: What Comes After was the top-seller among graphic novels and collected editions in a month in which sales for those were slightly off the totals for June 2012. The full estimates will appear on Monday.